Sign up and enter our events on the river ($15 see below) or just come down to have some shore fun with us (FREE) while we raise money to help build a permanent Surf wave in downtown Galt. Help us make Cambridge a major Surf destination. Races, demonstrations, food and drinks, children’s activities, prizes to won and more! Vendors Market 10am to 5pm. Sign up for on water events below. Fee: The fee is $15 for non Surf Cambridge and non Whitewater Ontario members. 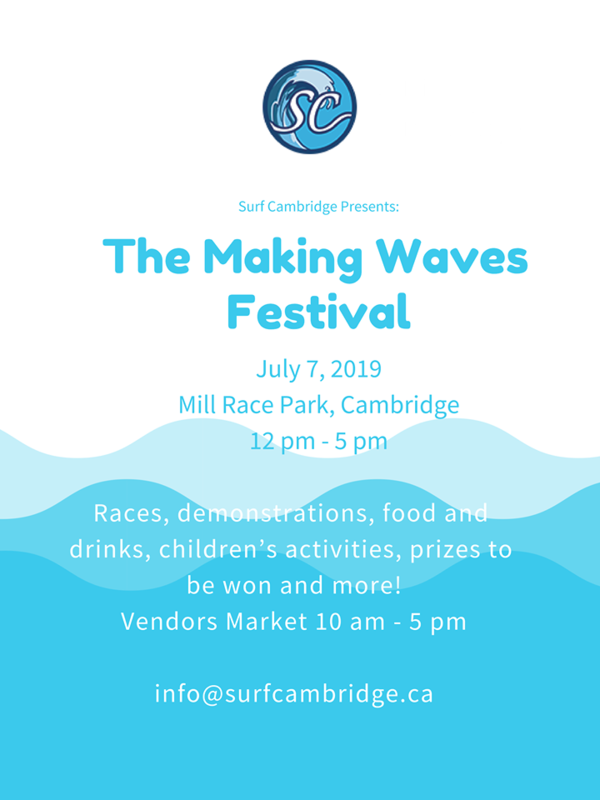 The fee pays for your Surf Cambridge membership and Whitewater Ontario Insurance and aoutmatic entry into all events listed below. If you wish to skip an event then please let us know. A small rental fee of $20 will be added for people without boats. All beginners are welcomed and encourage with lots of instructors around to mentor you. Good luck! ON WATER EVENTS with prizes!